The Wilmington Hurricane Youth Football Program bantam team has advanced to the second round of the Western Ohio Junior Football Conference playoffs. The young Hurricane will play at 9 a.m. Saturday at Alumni Field. The Wilmington fourth grade team also advanced to the second round and will play at Noon Saturday at Alumni Field. Other WOJFC playoff games will also be played at Alumni Field Saturday, featuring third-, fifth- and sixth-grade teams. In the photo is the bantam Hurricane, from left to right, front row, Justin Maereen, Malique Nance, Carson Beatty, Braxton Reed, Jaycen Constant, Gavin Foster, AJ Ashcraft; middle row, Khaleeq Andrews, Caden Culberson, King Price, RJ Hubbard, Brady Young, Elijah Long, Mark Thompson, Micah Murphy, Jelauhn Davis; back row, coaches Ben Reed, Phil Soales, head coach Mario Stewart, Jamie Pritchett. https://www.wnewsj.com/wp-content/uploads/sites/22/2018/10/web1_FB_wilm_bantam.jpgThe Wilmington Hurricane Youth Football Program bantam team has advanced to the second round of the Western Ohio Junior Football Conference playoffs. The young Hurricane will play at 9 a.m. Saturday at Alumni Field. The Wilmington fourth grade team also advanced to the second round and will play at Noon Saturday at Alumni Field. Other WOJFC playoff games will also be played at Alumni Field Saturday, featuring third-, fifth- and sixth-grade teams. 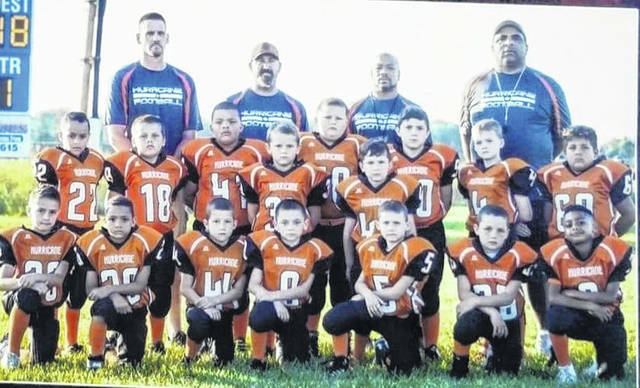 In the photo is the bantam Hurricane, from left to right, front row, Justin Maereen, Malique Nance, Carson Beatty, Braxton Reed, Jaycen Constant, Gavin Foster, AJ Ashcraft; middle row, Khaleeq Andrews, Caden Culberson, King Price, RJ Hubbard, Brady Young, Elijah Long, Mark Thompson, Micah Murphy, Jelauhn Davis; back row, coaches Ben Reed, Phil Soales, head coach Mario Stewart, Jamie Pritchett.